This is SKYRACK No 22, dated 12th August, 1960 and published by Ron Bennett of 7 Southway, Harrogate, Yorkshire, England, at 151 Canterbury Road, West Kilburn, London NW6. 6d per copy, 2/6d for 6 issues. Subscriptions in USA @ 35cents for 6 issues (six issues airmailed for 65cents) to Bob Pavlat, 6001-43rd Avenue, Hyattsville, Maryland, USA. 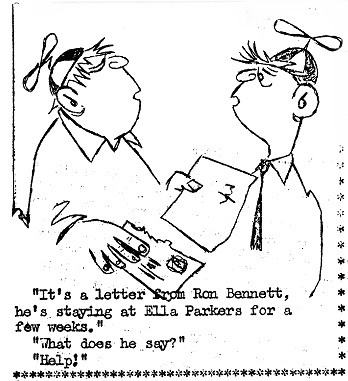 Cartoon on left by your friend and mine, Arthur “Atom” Thomson. News of interest to sf fans welcomed with open arms. This issue circulated free to members of BSFA. This issue of SKYRACK is being produced in London, as you’ll have gathered. Once again I’m down in the Smoke for a six week spell and Ella Parker has kindly agreed to put up with me. Fans are dropping in and out continuously. Archie Mercer stayed over last weekend. Ken Cheslin, who is in town, will be here this weekend. Tom Porter of Newcastle and Michael Evans of Monmouthshire have been other recent visitors. Once again I’m working as a typist for the agency which has employed me previously. This time they’ve farmed me out to a firm which looks like keeping me for the entire six weeks, Marplan Ltd, a market research oranisation which makes Vance Packard look like a barrow boy. Great fun, and work - they have micro-elite typewriters, and electric duplicators - which appeals to the fan in me. BSFA MEMBERS, take note... Ella is now holding open house for all BSFA members every Friday evening. Come along and meet other members. If you’re in the BSFA you’re sure of a welcome. Ella Parker reports that Ron Bennett is growing a beard Bennett denies this rumou, saying it’s merely a week since he shaved. The title of this curt column is, of course, wishful thinking. Actually, one doesn’t get books (s-f type) from anyone these days One has to get out and dig for ‘em. Read Les Flood’s review column in NEW WORLDS 97 - very restrained references to them ghu-darned publishers, Les, if l may say so. At one time I wrote round a bevy, bunch or grottle of publishers, all with material in the s-f field, asking for review material for NEBULA. The only one who responded with any regularity was Hodder and Stoughton, who at least sent me copies of Charles Eric Maine’s books. The sales manager of Faber and Faber used to send me advance copies of their titles, too, but I was never sure whether this was for review, or in the hopes that F(M)L might invest in about 5,000 copies. FOOP No 1 (Ivor Mayne, 236 Queens Road New Cross London SE14 28pp) Coming along to create almost as much surprise as the recent SIDEREAL is this first offering from Ivor. This initial effort had material solicited for it over a year ago and while it is pleasing to know that Ivor has at last made an entry into the fanzine world as an editor, it is also true to say that the age of some of the contributions shows through rather badly, particularly so in book reviews. On the whole, though, there is a well-balanced line up of material from Vince Clarke on Fanlandia, “Penelope Fandergaste,” Laurence Sandfield on jazz, John Berry on trans-Atlantic phone calls (do I add a note here, Terry, to say what happened to me that night?) and Ken Bulmer with a time-capsule piece on the London Circle. FOOP is worth getting as an historical item; Ivor is shortly analgamating FOOP with the Potters’ BRENNSCHLUSS. Also taking us by storm is another newcomer, TRIAL (Dorothy Hartwell, 124 Stanley Road, Hornchurch, Essex), produced by a young lady who has been on the fringes of London fandom for something over a year and who possesses spirit in more ways than one. Not only is this first effort produced on a Gernan spirit duplicator, but Dot has had the courage to do her own artwork. The actual material does not compare with that in FOOP, but is still of an interesting and most certainly an encouragement-worthy level. Contributors are Archie Mercer, Jim Linwood, Mike Decckinger, Peter Singleton, Alan Rispin and Bruce Kidd. FRESH FACES AT FRESHFIELDS BUT RAIN STOPS PLAY at the Liverpool Group’s party weekend 30 July - 1 August. I had intended to put Ella on the train to Liver pool and to fly up ahead of her, but the service doesn’t run on Saturdays, so we went along together by train. We were met at Lime Street by Norman Shorrock and elder daughter, Janet, Keith Freeman, John Roles and TAFF delegate, Eric Bentcliffe. After a lengthy ferry ride across the Mersey, we arrived at the Shorrock household to find a barricade forbidding us entry and custodians Ina, Lynda and Roy Shorrock quite happy about the whole affair. Scattered around were cartoons from Arthur Thomson who was in the middle of a campaign aimed at Ella. A party developed (of course) when other fans, including Audrey Eversfield from Cheltenham, began to arrive. On the Sunday, the entire ensemble transferred the party to Freshfield, where fun was had in the station signal box (how did the Glasgow - King’s X express get diverted?) before the party moved to the beach in time to be caught in a deluge of hailstones. We dried out by playing cricket and rugby and by dosing ourselves with spirits. Keith Freeman won a competition by wading out the furthest into the Irish Sea (we haven’t seen him since) whilst Jim Linwood and Ron Bennett kept up their year’s unbeaten record at rugby. Back in Liverpool in the evening the party developed furiously with champagne flowing freely to the drun beats of jiving feet. A few fans went along to see the Merseysippi jazz band at a local club, only to find the boys at a nearby refreshment hostel and that Pete Daniels was absent having had a spike stuck through his foot earlier (hope you’re recovering ok, Pete, but how long have you been playing the trumpet with your toes?) Later fans moved over to the Jacaranda Club where John Roles sold Audrey for 4d to an Indian with whom he conversed for hours in exotic native tongues We were surprised to run across PLOY’s ex-art-editor Bill Harry here. After a taxi race back to Higher Bebington Norman Shorrock showed his acrobatic skill by swinging from the landing banisters. We finally got him put to bed, though, and he recovered in good time to lead the nap game the following day when Audrey returned to Cheltenham and I came back to London. Keith Freeman stayed on until the Tuesday and Ella, lucky devil, was hosted by the Shorrocks until the Wednesday, returning to London an abnormally nervous wreck. The Liverpool party to end all Liverpool parties.